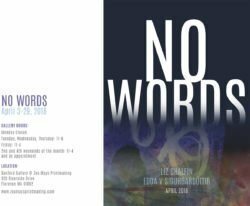 No Words brings together the monotypes of Edda V. Sigurdardottir and the print collages of Liz Chalfin in an exhibition that looks at typography and the visual narrative. Both artists work with aspects of story telling without using words. Edda worked as a graphic designer for decades, accumulating extensive training and experience working with type. For Edda, letterforms offer wonderful shapes with both positive and negative space. Each letter has its own character. They can be sharp or smooth, open or closed, forceful or meek. In approaching the work in this series, she examined the character of each letterform – to realize its impulses and how to adapt the color, movement, light, and mood of each one. We know how letters should appear on a line, marching in perfect order. But, by spinning them on their axis, Edda invites the viewer to more fully experience letters as shapes. Her chosen medium of monotype suits her empowerment to visually convey ideas and feelings. Her process is to envision a color palette that then guides the creation of forms and composition. Through a combination of color and composition, she strives to loosen the viewers attachment to letterforms as simply representations of sound and to look deeper to discover their innate beauty. Liz’s collages are made from fragments of etchings carefully deconstructed and reconstructed into small visual narratives. She began this process as a way to deal with all the failed prints, artists’ proofs and unfinished starts that have lingered in her flat file for years. Through the process of cutting up old images, and reconfiguring them with other fragments, she is able to create new narratives. Liz’s interest in the human condition comes through in these accidental story collages as evocations of wonder, anticipation, curiosity, isolation and other complex emotions.